Surgeries are frightening. The thought of one can drive a typical person to a brink of anxiety. After all, surgeries are painful, are they not? But once you have moved passed all that anxiety and pain, you should still think of surgeries. It is normal for a patient to experience some side effects after an operation. And yes, the pain you are experiencing now may be one of the side effects. There are people who put themselves at much risk because of their medical conditions. 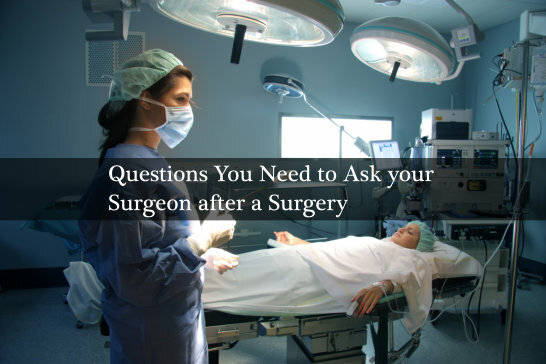 Your surgeon is the one capable of telling you what you may feel after an operation. He or she is able to give you the different dos and don’ts. What is the duration of your hospital stay? How long should you be housed in the hospital for recovery? Patients are advised by medical professionals, especially their surgeons, to stay in the hospital for recovery. This is vital to most patients in order to prevent infections and to monitor his or her state of health. What supplies, equipments and help do you need when the hospital gives you the go signal to go home? After a surgery, you have to go home with your hands full. Your surgeon or doctor may provide you medications. You may even need equipment to help you go through your day. And there are others who need our Rehabilitation Services in Flemingsburg, Kentucky. How long do you have to rest before being fully recovered to work? Ask your doctor how long your stitches have to heal up before you work. We know working for you is important because it brings in finances for you and the family. But hear us out. You have to be in full condition before you work. Otherwise, you might be having another trip to the hospital once again. What are the things and activities you need to avoid? Prevention is better than cure. It is better to sacrifice some things and pleasures in life than to pay the price. When is the perfect time to exercise again? When you are on your recovery journey from your surgery, you need to give your muscles some time before you work them off. Ask your doctor about this, or you can simply go to Pioneer Trace Healthcare & Rehabilitation for a healthy and safe recovery. Once you follow your doctor’s advice, you will be up in no time. Visit www.pioneertrace.com forexpert care and assistance. This entry was posted in Therapy and tagged helping physically, mentally disabled, sufficiently knowledgeable, Surgery. Bookmark the permalink.